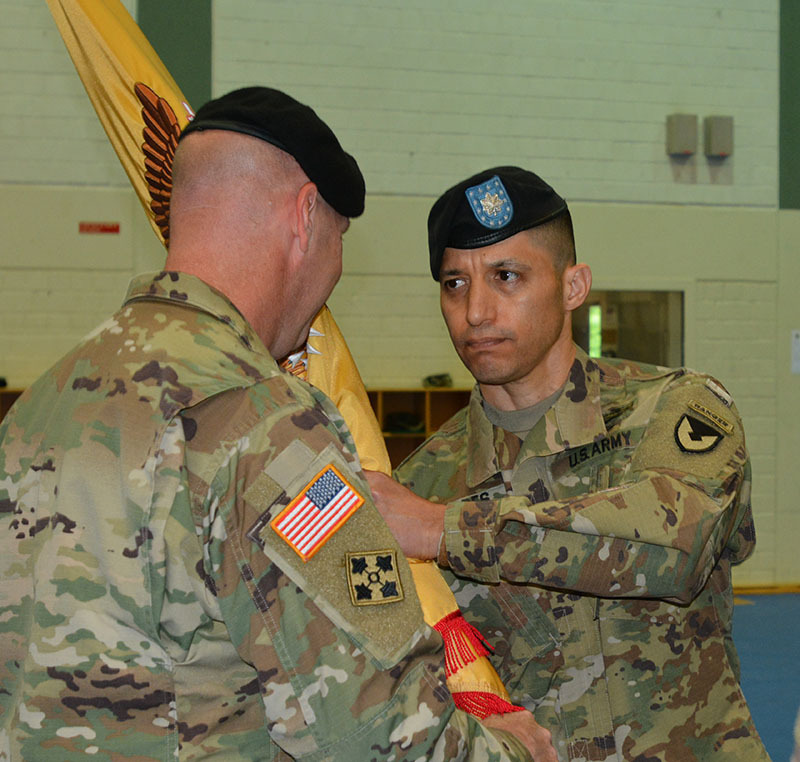 GRAFENWOEHR, Germany — Lt. Col. Isaac M. Torres assumed command of the 928th Contracting Battalion–Germany from Lt. Col. Jerel R. Grimes at a ceremony here June 21. The ceremony and passing of the command’s colors was presided over by Col. Douglas S. Lowrey, 409th Contracting Brigade Commander, Kaiserslautern, Germany. The 928th CBN Regional Contracting Office Bavaria mission is to provide operational contracting support to the Bavaria military community and throughout U.S. Army Europe’s area of responsibility. The 928th CBN deploys contracting forces worldwide. “Lt. Col. Jerel Grimes leaves behind a legacy of greatness. I have been doing Army contracting for about 15 years now and I have seen none better,” said Lowrey. Under Grimes’ leadership, the battalion delivered more than $360 million and 13,000 estimated contract actions, which supported the garrison, expeditionary and contingency contracting operations. “When this journey began three years ago, I quickly realized this organization was full of extremely capable and competent acquisition professionals. All I had to do was get out of their way and let them do their jobs,” said Grimes. Grimes consistently exhibited a proven capability to plan and execute a wide array of functions in support of USAREUR’s Regionally Aligned Forces, while establishing the standard for integrating rotational contracting teams from the Mission and Installation Contracting Command to perform expeditionary contracting and centralized contracting acquisition system operations. In Grimes’ closing remarks, he encouraged his former team. “To the 51Cs (Contracting Noncommissioned Officers), take note and truly appreciate where you are. This organization provides the perfect opportunity to level up and develop your skill set. It’s a leadership laboratory. Carry on tradition,” he said. “Isaac is a quality officer with a great reputation who gets things done,” said Lowrey. Grimes’ next assignment is the U.S. Army War College in Carlisle, Pennsylvania. “I am humbled and honored to be your commander and look forward to continuing the successes of this great organization,” said Torres.